Retailers are finding that consumer demand is getting more unpredictable — which increases the importance of changing the way they manage inventory. Stockouts can be as much of an annoyance for the customer as for a business. Stockouts become little black holes which can that leave you locked in limbo where your product order can’t be filled. Customers grow frustrated and resentful as they wait for new inventory to arrive. A simple three-step approach from the NACDS and can be applied to address Out-of-Stock issues. 1. When assessing Out-of-Stock, create both a product ranking and a store ranking, i.e., which products have the highest level of lost sales due to Out-of-Stock (or which items have been strategically identified on other criteria to have higher availability levels), and which stores have the highest level of lost sales due to Out-of-Stock. 2. Define the targeted amount of Out-of-Stock reduction desired, and then allocate the amount of gain to be achieved from product based Out-of-Stock reductions (store or ordering types of solutions) and from store based Out-of-Stock reductions (shelf or operations types of solutions). 3. Apply the identified solutions in the assessment specifically to those products (across all stores) and those stores (across all products). This will provide an estimate of the resource level needed to achieve the goal, and the degree to which adjustments can be made based upon the available resource. This targeting will keep work and disruption to a minimum. Once the solutions are implemented across these products and stores, a greater level of resources could be applied to additional products and stores. By using inventory management appropriately, a warehouse, distribution center or manufacturing business will be able to go a long way in ensuring a happy customer and a healthy business. One of the quickest ways to have reduction in out-of-stocks is by empowering the staff to be more efficient and more flexible in the workplace. Offering mobile workstations with a powerpack has change the game for companies around the world. 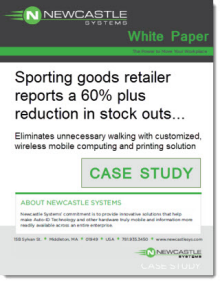 Learn how a leading specialty retailer, and the world’s largest direct marketer of hunting, fishing, camping and related outdoor merchandise was able to see a 60% plus reduction in stock outs, with as much as 33% more products available since deploying a mobile printing solution in its stores.